In my quest to go completely barefoot, or as near as possible in as many environments as possible, I've had my eye on replacing all my chunky shoes with more minimalist shoes. I've had my eyes on a couple of brands, including the VivoBarefoot range from Terra Plana, but haven't really seen any in person to get an idea of what they're like. I also wasn't too keen on blindly shelling out for a pair of shoes I'd seen on the internet, have them imported from the US only to find they're hideous in person. Well, luck was on my side as I was approached by a kind lady on behalf of Terra Plana and given the opportunity try a pair of shoes from their VivoBarefoot range. After much umming and ahhing - "Do I go for the casual looking Aquas for everyday use, or the more formal looking Dharmas for work use?" - I opted for the Aquas, in white (other colours are available), and placed my order. A couple of days later, a great big box arrived in the post. I was only expecting a shoe-box sized box, but this was double the size. I soon found out why... there were two pairs in the box: one in the size I'd ordered (UK 10 / EU 44) and one in the next size up (UK 11 / EU 45). 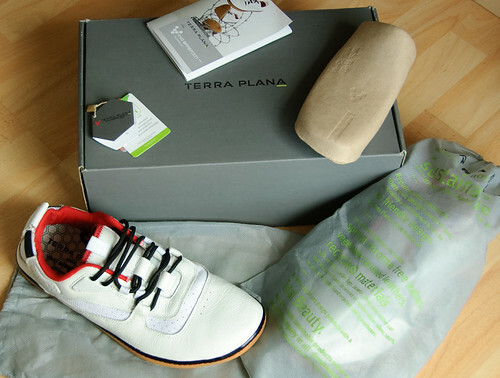 It's at this point that I must point out that Terra Plana is probably the greenest shoe company on the planet, within their control. Not only do they regularly re-evaluate what they can do to minimize waste and toxin use in their products, they try their hardest to make sure they use recycled materials and even make the box they sell the shoes in fully recyclable. Now how's that for green. Time for my fitting. I have a very "rigorous" sizing test: I put them on, and then wonder around the house or sit in front of the computer until either it hurts, or I remember I need to try the other size. First off the 10s: they fitted and were quite snug and comfy. After about an hour I remembered I was testing the sizes and switched to the 11s. What a difference. The 11s definitely felt bigger though I wasn't too sure if maybe they were a little too big. No time for deliberating; this is a scientific test, so let the shoes speak for themselves. I soon completely forgot about the 11s on my feet. They felt very comfortable, but I wasn't going to rule the 10s out just yet. Time for a bit of side-by-side comparison: size 10 on one foot and size 11 on the other, and then switch. This final test was the clincher - definitely the 11s. As I've since read elsewhere, the VivoBarefoot shoes size a little on the small side and my experience confirms this. As I mentioned above, Terra Plana are devoted to making sustainable and eco-friendly shoes, and we can see this in the construction of the Aquas. The upper: this is a combination of E-Leather - a 75-80% recycled leather and synthetic fibre combination that looks and feels like real leather - and a synthetic mesh-like fabric made from recycled polyethylene terephthalate (aka PET) panels. This combination gives an attractive, light and flexible upper. If you recognise the acronym PET, that's because it's what coke bottles are made from. It's also the stuff that is recycled to make fleeces, and now the fabric in the Aquas. The inner: this is made up of several parts too. The inner as a whole is soft with a little bit of cushioning around the entrance of the shoe with a sock-like inner liner that is the length of the tongue. There is also a very thin foam removable inner sole. As with the upper, the inner is made from recycled materials. The sole: this is an "ultra-high abrasion and puncture resistant sole" which is incredibly thin (3mm) and very flexible. Unfortunately, this part isn't made form recycled materials, but it is stitched onto the upper rather than being glued, so all is not lost on the green credentials here. Over-all the construction is very good and well thought out. Time will tell how durable they are. I've been a big fan of Merrell shoes for years - so much so I bought the same model and colour 3 times in a row. I found them incredibly comfortable and hard wearing. Sadly, these guys now pale in comparison to the VivoBarefoot Aquas: these shoes are singularly the most comfortable shoes I've ever worn. The sock-like liner hugs the shoe onto the foot very comfortably so technically you don't need to fasten the laces to hold the shoe on, though tightening the laces does secure the shoe better. The lack of heel, took a little getting used to at first. When I first tried on the Aquas, I'd just taken off my work shoes - a smart pair of black leather shoes - and instantly noticed the lack of a heel. It felt like the front of my foot was raised higher than the heel, but this soon faded. One significant thing I found with extended wear and time on my feet in the Aquas: I didn't experience the lower back pain I sometimes got when wearing the Merrells for extended periods of time. This could be co-incidence, but I'm inclined to believe it's the lack of heel, which in turn has resulted in an unnoticeable and slight improvement in posture as detailed in thebenefits described by Terra Plana themselves. The thin soles and thin inner-sole really allow you to feel the ground below your feet too, and whilst you don't get as much feedback as you do from Vibram Five Fingers, you still get plenty. The slight cushioning also makes heel striking, that is common with walking, a lot more comfortable and tolerable too. I don't think everyone will like the look of the VivoBarefoot Aquas (my borther-in-law doesn't). They are quite a low profiled and wide shoe, but unlike the tyres on sports cars, society seems to think low profile (and minimalist when not slip-slops) shoes look weird. The toe box is also wider than normal shoes, and whilst it's very comfortable, some people will associate the wider toe box with lower intelligence, a lack of class and even clowns (people come up with the strangest excuses). I personally think the Aquas look great, and I really like the white ones. I'm not concerned with what people think of my shoes, or lack there of. I'm comfortable in the knowledge that I'm doing the world of good for my body, and that's all that counts - I also had disproportionately large feet as a child so I soon learnt to ignore any comments about my feet. I have to admit I am very very impressed with the VivoBarefoot Aquas. They are incredibly comfortable, light, attractive, and even in the short period of time owning them, I'm already noticing the benefits. I think the best way I can summarise wearing the Aquas is it's like wearing your slippers everywhere, but without the fear of the men in white coats coming to take you to a comfortably padded room. I used to take off my shoes the moment I walked in the door, I don't when wearing the Aquas. These are singularly the most comfortable shoes I've ever worn, and I'll be wearing them at every appropriate opportunity that isn't already taken by wearing my Vibrams or no shoes at all. I've deliberately not mentioned running in these. I wouldn't advocate it. The Aquas are definitely a casual shoe, and whilst you probably could run in them, I suspect you may soon find they're not the best for running. All is not lost though,Terra Plana are bringing the VivoBarefoot Evo early next year. One final tip: if you're buying these online without trying them on first, order one size larger than you usually wear.